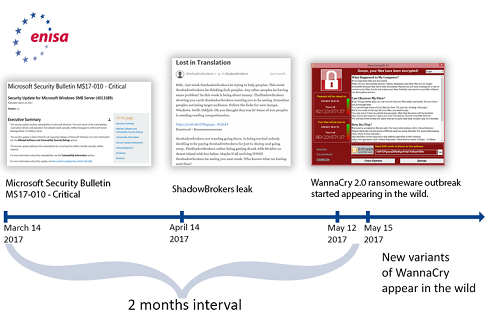 On May 2017, multiple companies and organisations around the world were hit by variations of a crypto-ransomware dubbed WannaCry / WannaCrypt / WanaCrypt0r / WCrypt / WCRY (here on called WannaCry for simplicity). The ransomware also acts as a worm and once it infects a system, it then self-propagates throughout the rest of the network. The ransomware campaign caused chaos due to its massive distribution, affecting more than 150 countries and infecting over 190,000 systems. Interestingly the attack was mounted on Friday 12th May 2017, just before the weekend, making it very difficult for companies and organisations to quickly react and resolve the crisis. Phishing/spear-phishing was used as an initial attack vector followed by the worm-spreading functionality of the ransomware which exploited a Microsoft Windows vulnerability. Internet scanning for systems vulnerable to a Microsoft Windows vulnerability and remote exploitation of the vulnerable systems. What’s particularly interesting about the WannaCry ransomware variant is its successful worm-spreading functionality. It exploits an known SMB vulnerability (Server Message Block is a Microsoft Windows protocol for file-sharing over a network) and once a system becomes infected the ransomware propagates to the rest systems of a network and infects them if they are vulnerable. Moreover, it also scans for public IPs in its attempt to infect external networks as well. 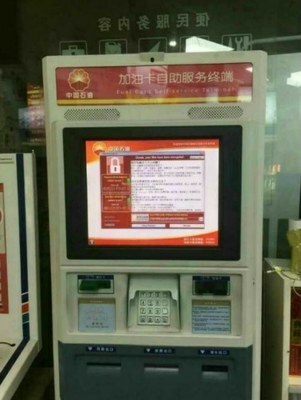 WannaCry ransomware exploits an SMB vulnerability (EternalBlue/DoublePulsar) that was revealed in the recent “Shadow Brokers” leak in April 2017. The leak contains hacking tools/cyber weapons allegedly owned or developed by the NSA. The fact that the ransomware essentially also acts as a worm is the main reason for its speed of propagation. This is not the first time such a worm-spreading approach has been seen. Conficker (2008) is another example of a worm exploiting an earlier Windows SMB vulnerability MS08-067 with a similar worm spreading technique, which effectively infected millions of computers around the world. The key difference is that WannaCry is encrypting files in the infected systems making the effects of the infection even more devastating. WannaCry is not the first “ransomworm” (ransomware and worm) either, Zcryptor and Alpha had worm spreading capabilities. 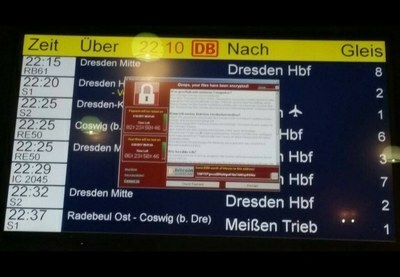 A few hours after the outbreak of the ransomware a security researcher managed to constrain the rapid spread of WannaCry by registering a domain identified in the binary code of the malware, which was used as a kill-switch. The registration of the domain enabled the kill-switch and slowed down the malware propagation. Since the malware was not proxy aware (ignoring the proxy settings of the machine), the kill-switch was not as effective as was initially thought to be. A few other variant/s with different kill-switches have already been identified. WannaCry has spread through a massive campaign affecting over 190.000 organisations and companies around the world from different sectors. To name a few: Spanish Telecommunications company Telefonica, UK’s National Healthcare Service (NHS), Deutsche Bahn systems, Renault and Nissan and manufacturing plants, Universities etc. If your system has been hit by the ransomware do not pay the ransom. It is highly probable that paying the ransom will not lead to the decryption of your files. There is evidence that people who have already paid the ransom have not had their files decrypted. Windows 7 , Windows 8, Windows 8.1, Windows 10 with UAC and had shadow copies enabled prior to the infection you might be able to restore your files from shadow copy. DO NOT click YES on the UAC prompt window appearing during infection. 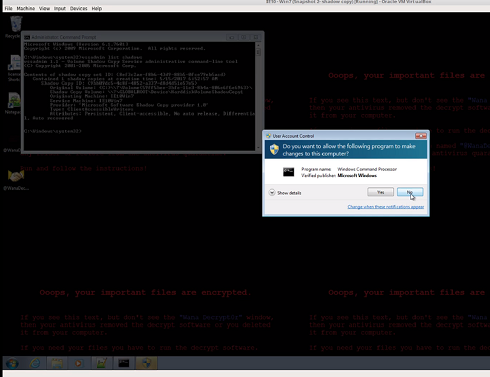 The malware does not have a valid way of bypassing UAC so your shadow copies are never deleted. You can disinfect the machine and then proceed in restoring all of your files using your shadow copies which are intact using this guide. Even though the patches were available since March 2017, the impact is quite significant. It should be noted that the similar Conficker malware infection millions of users. This is because in particular cases patching is not that straight forward due to the type of work and characteristics of the systems in certain types of environments. For example, critical financial systems used by banks, stock markets or other organizations running legacy systems that would not risk in deploying such patch due to the potential negative impact. The evolution of ransomware has been significant. From simple ransomware that locked the users’ systems, ransomware quickly moved to crypto-ransomware, then to ransomware with wiping capabilities (being able to spot and erase system backups) and finally to ransomworms with worm-spreading capabilities. It is now clear that after WannaCry the trend of ransomworms will rise and many improved copy-cats will appear aiming for a share in this lucrative business. Self-propagating ransomware and other types of malware with remote code execution capabilities are going to be the next big threat of cyber security. Adding the inherently insecure IoT devices to the equation, the consequences are more than foreseeable. Thus the world and Europe must learn from current events and be in a position to respond when the next crisis arrives.